Named after one of the original players in the group, Owen Street, this collection of players started off playing at the now closed Top-O-Scott Golf Course. Now they play regularly at Sah-Hah-Lee every Monday, Wednesday, and Friday at 10:30am. Many play 18 holes, though some may only play nine. Usually they finish up with a highly competitive game of gin in the pro shop! 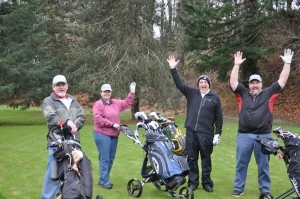 Join this fun group of golfers at any time. No need to reserve a tee time or preregister. Pay just your greens fees and whatever game they play for the day. The group keeps it’s own updated handicaps for the group and usually play a Net game, front 9, back 9, and total 18.